Shaver’s Creek Environmental Center is home to a variety of hawks, owls, eagles, vultures, and falcons — a group of birds known as raptors. 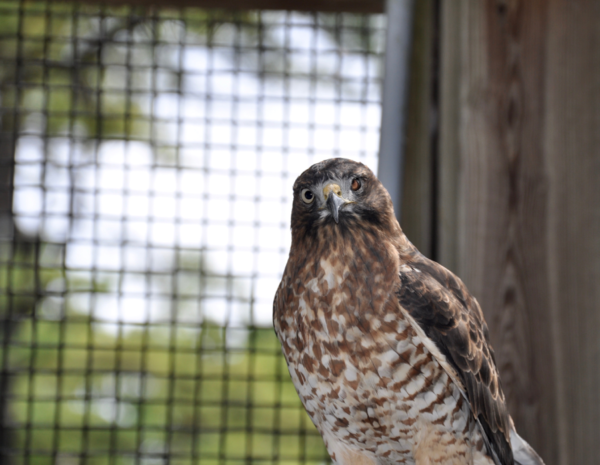 All of our resident raptors arrived from rehabilitation centers with permanent disabilities and they are permitted to Shaver’s Creek to work alongside our Animal Care staff and volunteer team as ambassadors for their wild counterparts. 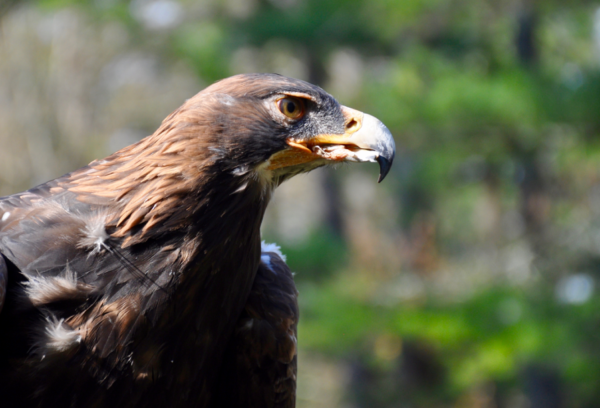 Stop by to meet our feathered coworkers: watch a training session, observe a vulture displaying natural foraging behavior, or see a Golden Eagle tearing up enrichment. The public is invited to visit Shaver’s Creek on the weekends from mid-June to November for Meet the Creek, a free public program where an interpreter answers questions and presents several birds to the public, giving you an up close look at the birds out of their enclosures. 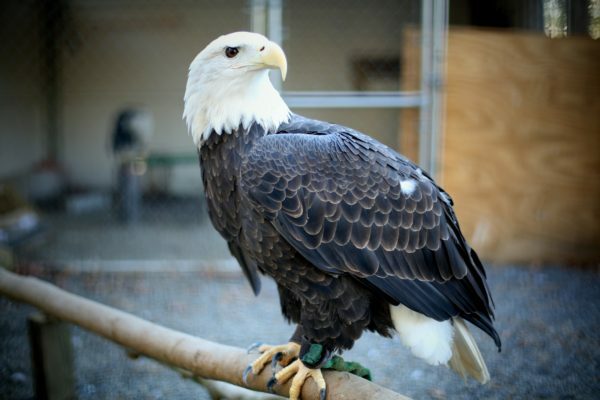 Charles – The Bald Eagle was on the brink on extinction in the lower 48 states in the latter half of the twentieth century due to illegal hunting and DDT. However, through diligent effort from government agencies, conservation groups, environmental regulations, as well as the Bald and Golden Eagle Protection Act, our national emblem has made an incredible recovery and was removed from the endangered species list in 2007. In winter, Bald Eagles may congregate in large numbers around bodies of water, preying on fish and waterfowl. For more, check out the Hanover Bald Eagle Nest camera. Jerudi, Cook, and Chauntay – Listen for Barred Owls calling at dusk and dawn with a distinct 8-note “hooting” call (“Who cooks for you? Who cooks for you all?”). Barred owls do best in old growth forest, where they nest in secondary tree cavities. 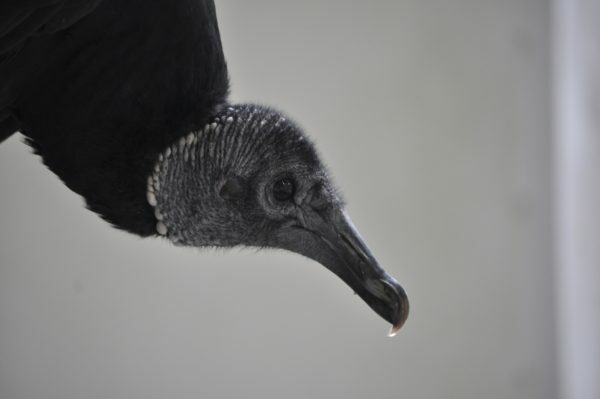 Matilda – Black Vultures are known for their ability to scavenge on carrion, making them essential to maintaining cleanliness and reducing risk of diseases such as rabies and botulism. Matilda, our Black Vulture, demonstrates this by picking through enrichment objects to find morsels. Cosmo – Barn Owls are known for their distinctly heart-shaped faces. 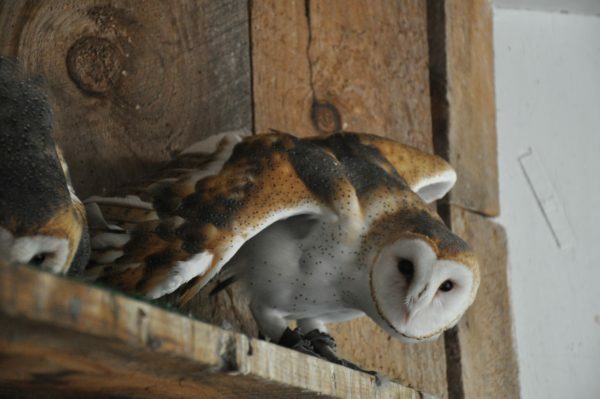 Cavity-nesters by nature, Barn Owls are so named because they are often found nesting in barns — indicative of their ability to thrive in a variety of environments. For this reason, Barn Owls are found on all continents except Antarctica. Tea – Watch for migrating Broad-Winged Hawks during the months of September and April, forming groups called “kettles” in thermals or slope-soaring along Pennsylvania ridges. This small, stocky species depends on large tracts of forest to breed. 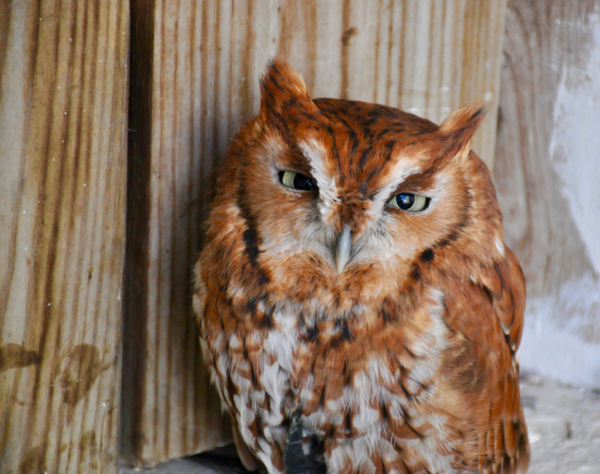 Rufous – Eastern Screech Owls habituate well to human habitats, oftentimes residing in suburban neighborhoods and city parks. Eastern Screech Owls nest in tree cavities. Barbi and Cere – A widespread species of the Americas, Great Horned Owls have the ability to hunt a wide variety of species from small to large mammals, including skunks — with a grip strength as high as an eagle’s. 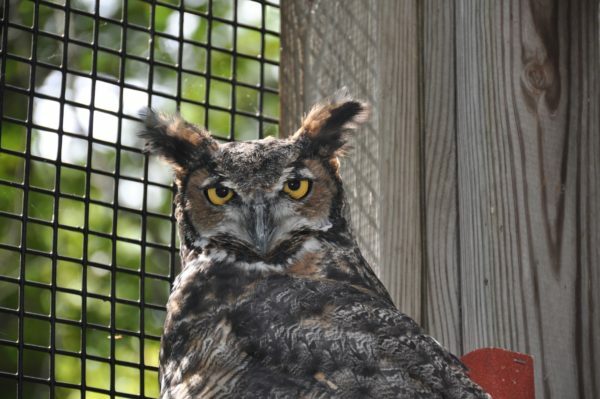 The “horns” on a Great Horned Owl are just feathers that serve as camouflage and silent communicators. Tussey – Golden Eagles migrate through central Pennsylvania, but generally when cold, northwesterly winds strike our ridges in late fall and winter. A few winter in rural areas of the state. One of the best place to observe Golden Eagles in the east is just a few miles from Shaver’s Creek on Tussey Mountain. To learn more about how to observe migrating Golden Eagles, visit our Citizen Science page. Susquehanna – Keep an eye to the sky. Peregrine Falcons are the fastest animals on the planet as they dive at speeds around 200 mph to hunt their avian prey. And along with Bald Eagles, Peregrines are making a steady comeback after the banning of DDT, a harmful pesticide that caused this species to lay too-thin and easily-breakable eggs. Pennsylvania-born scientist Rachel Carson was instrumental in calling attention to the ecological impacts of DDT with her 1962 book, Silent Spring. 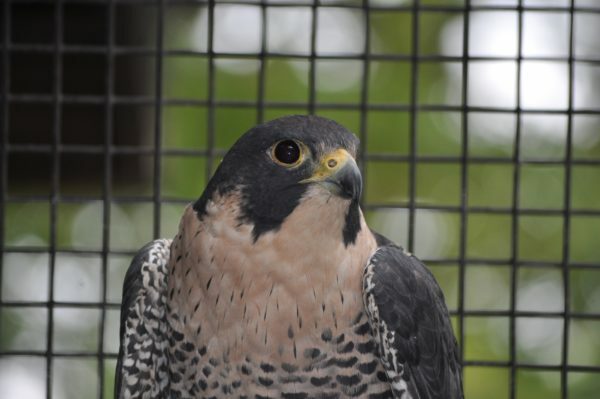 Learn more: check out the Peregrine Falcons that nest on the Rachel Carson Building in Harrisburg. Echo – One of three species of Buteos (soaring hawks) at Shaver’s Creek, Red-shouldered hawks are less conspicuous than larger Red-tailed Hawks, and generally found in proximity to wet forest edges. However, they can be readily detected by their distinct 2-syllable calls. As the name implies, this species is distinguished by its rufous-colored shoulder patches. 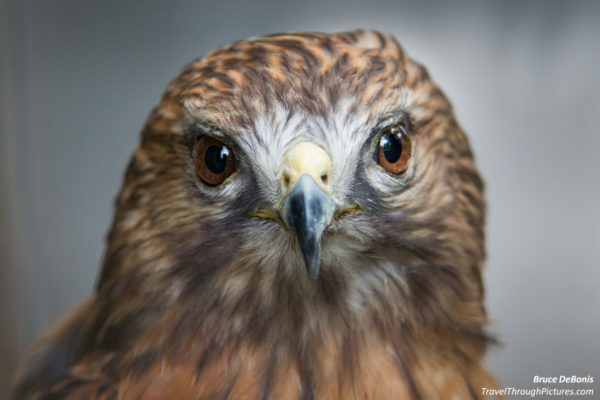 Alula and Jamaica – One of the most widespread and successful raptors in North America, they have adapted well to human habitats, including highway medians and cities. 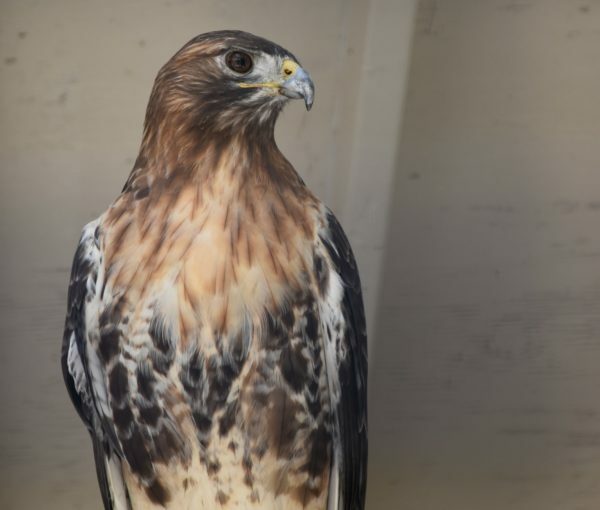 Soaring hawks like Red-tails are known as Buzzards on other continents. Like all migratory birds in the United States, they are federally protected by the Migratory Bird Treaty Act of 1918. This makes it unlawful to possess, pursue, hunt, take, capture, or sell birds or their parts (including feathers, eggs, and nests). Neo – The world’s most abundant species of Vulture, this species plays a significant role in the cleanup of carcasses, preventing the spread of diseases like botulism and rabies. 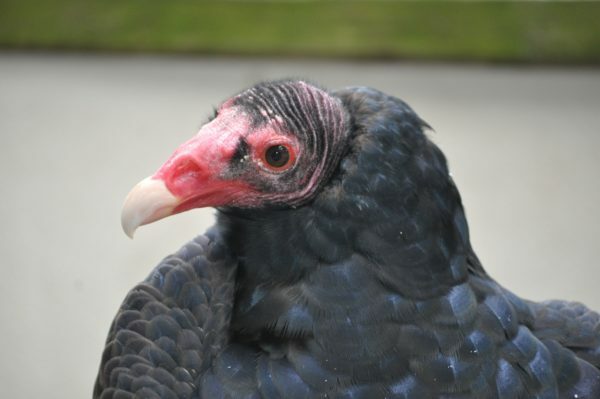 One of the few species of birds known to possess a well developed sense of smell, Turkey Vultures are well adapted to locating carrion with enormous, see-through nostrils.